The best indestructible dog toys will last your dog a long time while providing entertainment and cleaning her teeth. Whatever kind of dog you have, it is essential to provide chew toys to allow your dog to act out her natural instincts, relieve anxiety, and entertain herself. 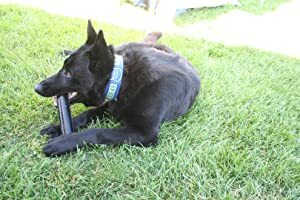 If you have a powerful, determined, or extreme chewer, it is that much more essential that you have unbreakable dog toys that will last for a long time. A wide range of chew toys with different textures and flavorings, including food-distributing toys and natural chews, will deter your dog from chewing on things that she shouldn’t, like your shoes or furniture. Dog toys that last can be left in your dog’s crate so that she will be less likely to chew on her bedding. You can improve the chances that your dog will chew on the appropriate items by choosing one of the best chew proof dog beds, but a great range of chew toys sets your dog up for success. Read on to choose the best toys for your dog, no matter how insistently or powerfully she chews. *Quickly choose a toy based on the chew level of your dog. Dogs that want to destroy toys. Toys that will last a long time with these chewers. Dogs who usually don’t care about chew toys. Dogs that chew all the time and need toys that won’t damage their teeth. The most unbreakable dog toys are made out of tough materials. Since your dog will be chewing on and even ingesting particles of the toy, it is important that it is made of safe and natural ingredients. When shopping for toys for your dog, look for all natural antlers and hooves and toys made out of high-quality natural rubber. When choosing nylon chew toys, choose toys with flavor all of the way through so that dogs maintain interest. Look for toys that break down into very small pieces that are easily digestible. Dog toys are made out of a range of materials and in a wide variety of shapes and sizes to fit all the different dogs in our lives. If you have a powerful chewer, it is important to buy toys that are made for dogs that destroy toys. Avoid hard plastics that may break or shatter and very soft rubbers that will be easy for your dog to rip pieces off of or chew into pieces. Stay away from soft or stuffed toys or rope toys which your dog will rip apart quickly and may ingest. Choose only those toys that are rated for your dog’s size and chew level and always observe dogs with toys for some time before leaving them alone with a toy. Here is a textured bone that comes in a range of delicious flavors to entice even the pickiest chewer. These bones come at a great price, so even if your dog goes through them quickly, you may not mind replacing them over and over again. This is a great dog toy for rough canines since it is designed for dogs that weigh more than 50 lb. You can feel good about buying this chew toy because it is made in the USA. As your dog chews on the delicious textured surface, bristles will be raised that clean teeth and massage gums while controlling tartar and plaque. If you are looking for a super chewer dog toy, this might be the right one for you. This is one of the most durable dog toys that you are likely to find. The ultra durable Zogoflex material doesn’t provide anywhere for your dog to get her teeth in. This makes it an almost unbreakable dog toy. 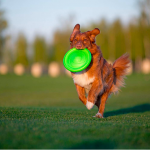 At the same time, there are contours in the ball that make it easier for your dog to grip the ball and also allow her to breathe while she is carrying it. This chew toy can float, making it great for water games, and the irregular shape makes the bounce unpredictable, invigorating more interest than a normal round ball. You can feel good about purchasing this product that is made in the USA. If you would like to use a ball thrower, know that this ball will fit into it. The ball is easy to clean since it is dishwasher safe. If you are looking for a dog toy for rough canines, this extreme tire toy might be the right one for you. This is one of the toughest dog toys for chewers that like to destroy their toys. 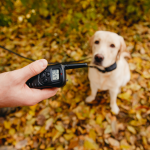 It is made of a heavy-duty rubber that can hold up to even very powerful dogs. A textured surface will help to clean your dog’s teeth and soothe her gums. The side walls of the tire are uniquely shaped to create a durable barrier that doubles up and compresses for a satisfying chewing experience.The round shape of this tire toy is also great for a fetch toy and tug of war as well. You can choose between three sizes. 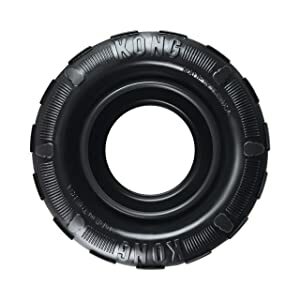 Feel good about this purchase since KONG is a trusted company with products made in the USA. 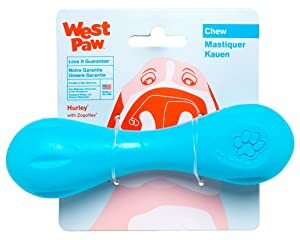 If your primary concern in buying a chew toy for your dog is improving her dental health, this might be the toy for you. 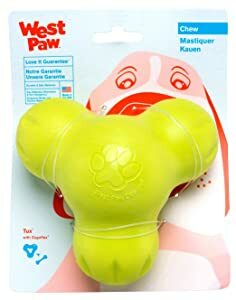 This dental chew toy has triple cleaning action due to the innovative shape and texture. This toy will go further to reduce tartar and plaque build-up than other chew toys. Your dog will be enticed to chew on this toy due to the irresistible bacon flavoring. 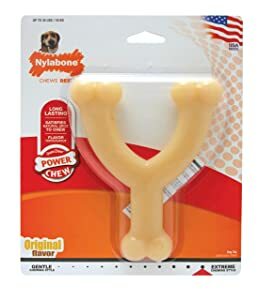 Even aggressive chewers will be able to keep playing with this chew toy for a long time, since it is made out of a durable nylon that will hold up to the most intense chewing for dogs weighing more than 50 lbs. 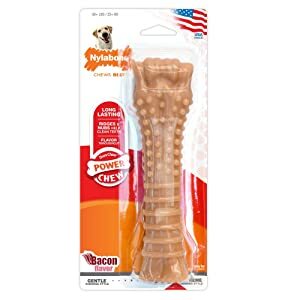 If you are looking for a dog toy that lasts with even the most intense chewers while continuing to deliver quality dental health, this might be the super chewer dog toy that you have been looking for. Works well for dogs over 50 lbs. Are you looking for an all natural, long-lasting chewing solution for your dog? These all natural antlers are healthy, safe, and sustainable. They don’t produce odor and mess like other edible chew toys or stuffable rubber toys. Because these are real antlers, they contain lots of essential vitamins and minerals like phosphorus, calcium, zinc and more. These antlers are healthy for your dog, and your dog will be naturally driven to get these minerals by chewing. Antlers will last a long time, but they are not as hard as a weight bearing bone from a large animal so they will not wear down your dog’s teeth. Elk antlers chew differently than other antlers such as whitetail deer or moose, so you can experiment and find exactly the best antler for your dog. All natural antlers come straight from nature. Environmentally friendly and sustainable since elk naturally shed their antlers every year. Wear down slowly so they last a long time, but won’t wear your dog’s teeth down like a weight bearing bone. Contains natural vitamins and minerals that are good for your dog and compel her to chew. Don’t have an odor or leave a mess on your floor. Tend to wear down into little daggers as your dog chews, so you will probably need to throw it away before it is fully worn down. Some determined chewers will go through it quickly, especially if they expose the morrow. You can’t choose the thickness or shape that you want online. Do you want a ball that is perfect to play fetch with but also can hold up to chewing and rough play? This durable ball is light and soft so that dogs can safely catch it in mid-flight. It has very good bounce, making it go all over the place for your dog to chase. It floats as well, making it a great ball for water fun. Choose between small or large sizes to fit your dog’s mouth. You can feel good about this ball since it is made in the USA. The bumpy exterior provides slightly unpredictable bounce. 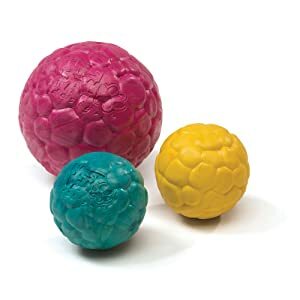 Because the squishy effect gives dogs satisfaction when they crunch on this ball, dogs that don’t normally care about balls may enjoy this one. Here is a multifunctional toy that can distribute treats and stimulate your dog with mentally engaging play. 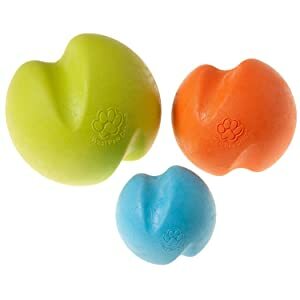 The convenient shape is perfect for dogs to chew on, great to carry, and perfect for games of fetch as well. Loose pieces of treats or carrots can be stuffed into the cavity or a single large bone can be stuffed in so it sticks out. Either way, you can really extend the interest in this toy. 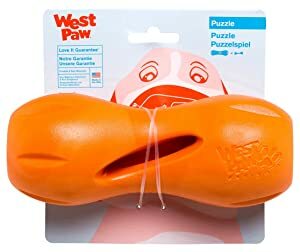 You can feel confident about the decision to buy this toy since it is made in the USA and is guaranteed 100% against dog damage by the manufacturer. Here is a great chew toy that cleans your dog’s teeth at the same time as it entertains her. 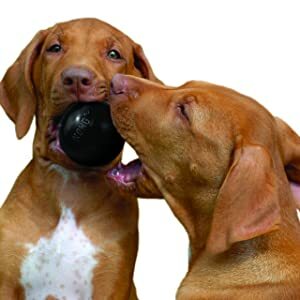 This is a heavy duty dog toy that can withstand even the most aggressive chewers. It can reduce the destructive chewing that occurs in your home. Even powerful dogs will find this chew toy challenging and won’t be able to break pieces off easily. As your dog chews, bristles will be raised that cleans the teeth and remove tartar and plaque. You can feel good about this chew toy since it is made in the USA. Does your dog find most inedible chew toys boring and uninteresting? 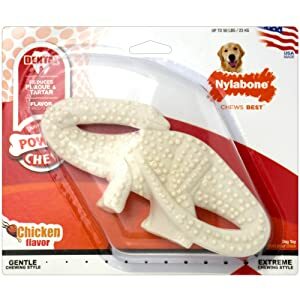 This Nylabone ring is tough and durable enough to keep even the most powerful chewers occupied, while the delicious flavor and textured design entices dogs that are generally uninterested in chewing. Raised knobs and rings provide enticing texture that also helps to clean teeth and fight the development of tartar or plaque. Dogs over 50 lbs will find this ring challenging, making it one of the toughest dog toys for chewers who are generally uninterested but can do some damage once they decide to get down to it. You can feel good about choosing this toy since it is made in the USA. Do you want a cute chew toy to occupy your dog and control tartar and plaque? This fun dinosaur dental chew will satisfy your dog’s desire to chew and also clean her teeth with the bristles raised during the chewing process. This fun chew toy is rated for powerful chewers up to 50 lbs. You could get a T-Rex, a stegosaurus, or a brontosaurus when you order this great toy. If you want your dog’s toys to be fun as well as functional, this might be a great pick for you. Does your dog laugh at products that are advertised as being indestructible chew toys? 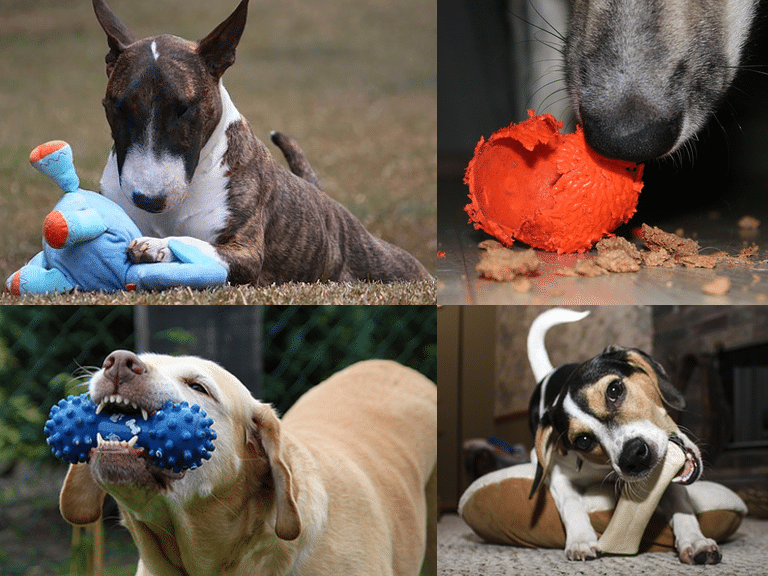 The most powerful chewers need toys that are designed to withstand their above average jaws. 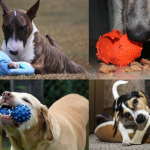 It is hard to find unbreakable dog toys that are safe for powerful chewers. 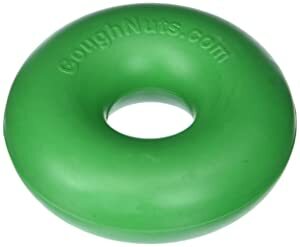 If you are looking for a heavy duty dog toy that can hold up to whatever your dog throws at it, look no further than this impressive Goughnuts. Black 50 is their most durable material, roughly 20% tougher than the original Black. It is made in the USA of all natural materials. If your powerful dog manages to chew through the stiff outer layer to expose the red inner layer, just send the toy back for a free replacement. Is it hard to convince your dog to chew on anything that isn’t food or a real bone or rawhide? Artificial, non-edible bones are great to entertain your dog and also good for the teeth, but they won’t do much good if your dog isn’t interested in chewing on them. This is a great heavy-duty dog toy for dogs that are usually uninterested in chew toys. 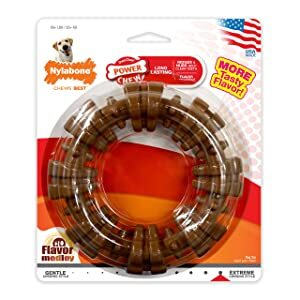 These clever bones have real bacon or barbecue flavor to get your dog interested in chewing and keep her chewing for a long time to come. 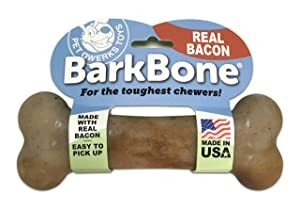 You can feel good about giving your dog this bone since the bacon and nylon, as well as ingredients used to make the barbecue taste, are all sourced in the USA. These bones are non-toxic and non allergenic so they are safe for your dog. As your dog chews on this bone it will massage her gums and provide a scraping action on the teeth. Does your dog go through tennis balls faster than a pro player? This is a dog toy that lasts and lasts through many games of fetch and sessions of chewing. Kong is a highly trusted name in pet supplies, and this fun and safe ball is one of their most essential products. Because this ball has a hole all the way through it, you don’t have to worry about a puncture wound causing dangerous suction like you do with balls without holes. Furthermore, you can stuff the hole with peanut butter or other stuffing to invigorate interest in your dog and entertain her for hours of chewing. The rubber cleans your dog’s teeth and massages her gums. You can even freeze this ball for more gum soothing power. Choose between small, medium, and large sizes to get the right ball for your dog. Do you a dog who only cares about chewing on things that provide food? Some dogs just don’t get into nylon or rubber chews, so an alternative must be considered. This is a great toy to occupy dogs who don’t normally care about chew toys. It can also help dogs transition into liking chew toys if they haven’t played with toys before. This is one of the most durable dog toys, able to hold up to intense play and chewing. You can stuff treats into this toy or even freeze treats within it to keep your dog entertained for hours. You can feel good about this purchase since the toy is guaranteed 100% against dog damage. This toy is made in America and is recyclable and dishwasher safe. The material is BPA-and-Phthalate-free, non-toxic and FDA compliant. 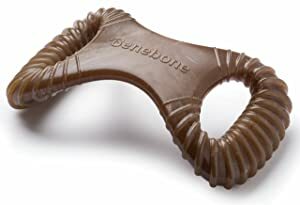 This flexible, bouncing, durable chew bone is designed for long chew sessions and powerful jaws. This bone can also float, so it is a fun toy for the pool or the beach as well. You can feel confident about your decision to buy this chew toy since it is 100% guaranteed by the manufacturer against whatever kind of damage your dog might do. You can feel even better about this purchase since this bone was made in America and is recyclable. This is a great dog toy for extreme chewers who like to chew for long periods of time. The EPA and phthalate-free construction is non-toxic and compliant with FDA regulations. Goughnuts is well -known for their innovative, highly durable chew toys. If you are looking for the toughest dog toys for chewers, Goughnuts is likely to have the right toy for you. These toys are virtually indestructible. If your dog does manage to do damage to the toy you will know because the inner red layer will be revealed. When this happens, simply send the toy back to the company for your free replacement. This chew ring is an excellent dog toy for tough chewers who have destroyed other toys. Furthermore, this ring is a great fetch toy and makes a wonderful tug toy for two dogs to play together as well. If your dog wants to chew, play fetch and play tug all with the same toy, all day long, this might be one of the only toys you will need. This is a chew toy that is really made for your dog, not to be appealing for you. The dog-friendly design makes it easy for your dog to get her chew on. The patented ridges offer excellent dental stimulation to provide teeth cleaning and gum massaging from the beginning of the chew. Your dog will love the real flavor that is sourced from only 100% real food ingredients. 100% USA-sourced real bacon is fused all the way through the chew. You can also choose from chicken, mint, or peanut. This is a product that is made and sourced in the USA. 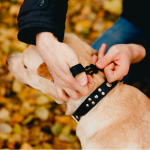 You can feel even better about buying from Benebone since they donate their products and are involved in the community for the wellness of dogs. Ridges can be chewed off quickly, reducing their effectiveness. If your dog is a powerful chewer who tends to go through toys quickly, or if she is the type of dog who is generally uninterested in toys until she decides to destroy them completely, don’t lose hope. Remember that your dog’s toys are for her, and if she is enjoying them then your mission is being accomplished. Use every toy as a learning experience to take you closer to finding the best toys for your dog. When you do find a toy that your dog loves and can enjoy for a long time you will have a feeling of deep satisfaction. Even better, once you find a toy that works well for your dog, you know that you can keep buying it over and over as your dog destroys it over the years. 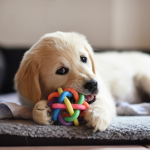 It may take some time to find the perfect toys for your dog, but once you have worked out the formula it will only take a little tampering to keep it perfect and keep your dog happy for many years to come.